A human can go for more than three weeks without food (Mahatma Gandhi survived 21 days of complete starvation), but water is a different story. At least 60% of the adult body is made of it, and every living cell in the body needs it to keep functioning. Water acts as a lubricant for our joints, regulates our body temperature through sweating and respiration, and helps to flush waste. Unlike food, the maximum time an individual can go without water seems to be a week. That estimate would certainly be shorter in difficult conditions, like broiling heat. –	Our bodies are constantly losing water, which is why drinking a glass of H20 once a day is not enough to keep the body replenished. We lose water when we sweat, go to the bathroom, and even when we exhale. –	We get some water from food, “but drinking water is your main, and best source, of water,” according to a website maintained by the National Institutes of Health. 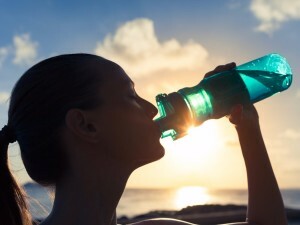 –	Other beverages like juice or milk also help keep the body hydrated. The only fluid you would want to stay away from is alcohol because it actually causes the body to lose more water than normal through excessive urination. 1. Do you know that you can go 100 hours without drinking at an average temperature outdoors? 2. Have you tried not to drink for 24hours?